Not that the rest of you who have tried on my other blogs to bestow awards on me and I am always flattered beyond measure and have turned them down. But I do thank you all from the bottom of my heart. Karen of IrelandBrady along with Stacy of Magic Love Crow have been so generous and loving to our inside, outside, upside down darling Ry. 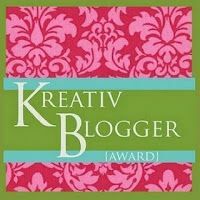 So because of their amazing outpourings, I will with accept this Kreativ Blogger Award. When you receive this honor, here are the rules or not depending on your mood or bent. 1.Post a link to the person who awarded you the award. 3. Bestow this award on 10 other deserving bloggers and then let them know. 2. My favorite food is Thanksgiving dinner, turkey, dressing, the whole sheebang. And I saw yesterday on the Food Network a Thanksgiving Po' Boy that has it all and is now offically my new favorite sandwich. 3. I once went on a starvation diet while working at a bakery and passed out. When I awoke I had the tray of chocolate donuts I had been carrying all over me. 4. I just recently found out that I can do without things I thought I had to have in order to be me. Good stuff. 5. When I was a little girl, I met and had my pictures taken with Roy Rogers, Dale Evans, Rin Tin Tin, and Hopalong Cassidy. I also was on TV with Glen Campbell at K circle B in Albuquerque. "Riding down the trail to Albuquerque, saddlebags all filled with beans and jerky, heading for K circle B, the TV ranch for you and me, K circle B in Albuquerque, yodel detay, yodel detay, yodel dee". And that's the real song. 6. In the past three years, I have learned more about life from my grands than the preceding decades. This blessing that I have had in my life has not gone unnoticed or unrecognized. My daughter and grands living with us has enriched all of our lives and we will forever be Casa de Cuckoos and proud of it. 7. I have begun to paint again after years away because of some wonderful friends who are so talented in so many different area and make me want to have the joy they have in what they do so well. Thanks my arting buddies. And so because I am the rule breaker I was born to be.....if there are those of you who would like to tell us some great stuff about yourself, please feel free to join in and post the Kreativ Blogger Award on your blog too. What about Trigger? Any photos of you and him? Seems unfair if he got missed. Great stuff! All wonderful things to know about a person.